Your fingers swell throughout the day, so the best time to measure your ring size is in the evening when your fingers are at their largest. Measurements for ring sizes should be taken below the joint of your finger, close the knuckle. If you are selecting a style with a wide band width, you may need to go up one size as thick rings tend to result in a tighter fit. See the table below to calculate the correct size for you. Esmée Bo. life bracelets are available in four sizes, ranging from small to extra large. 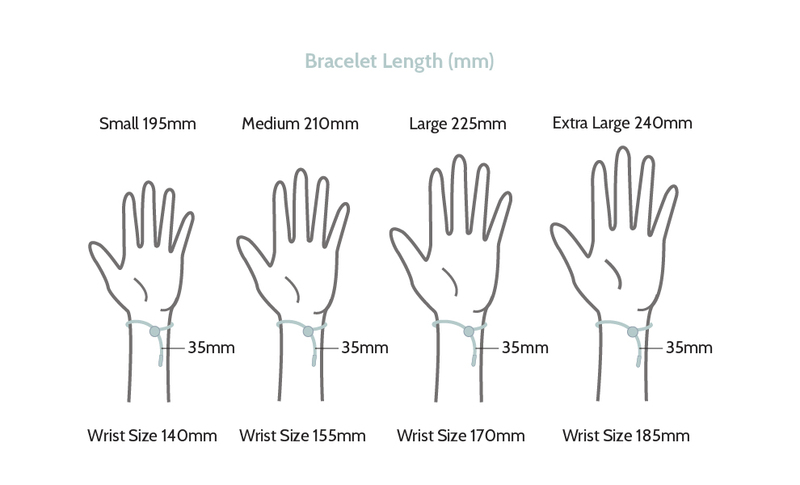 Medium is the most common bracelet size for women, and large best suited to the average man. However, the size will depend on how you like to wear your bracelet.